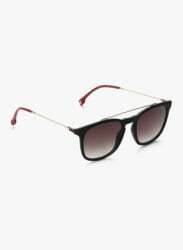 Make your kid look stylish by getting him/her these brown coloured sunglasses from Carrera. Made from plastic, these sunglasses are fitted with UV-protected lenses to keep your kid?s eyes safe from the sun. Pair these sunglasses with casuals to give a complete look to your kid.